The engineer had to make a stop for water at the tank at Marcellus on May 8, 1952, noting that “it got too light and had to stop for water.” This likely meant the tender got too low for them to make it further before running out of water. 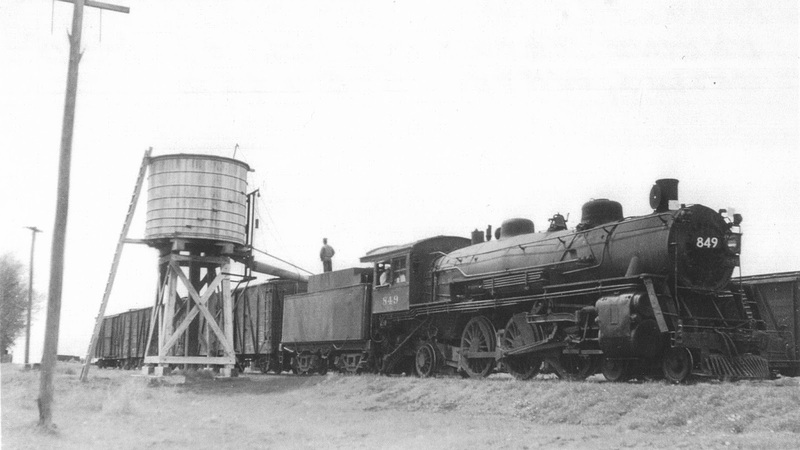 The size of the tank here is quite small, as it was built to only fill one locomotive a day, or so. The 849 was built for the Chicago, Milwaukee & Puget Sound as their 3120, and was renumbered for the Chicago, Milwaukee & St. Paul in 1912. It became the Chicago, Milwaukee, St. Paul & Pacific 849 after being rebuilt in 1938. It was retired from service 4 months after this photo.